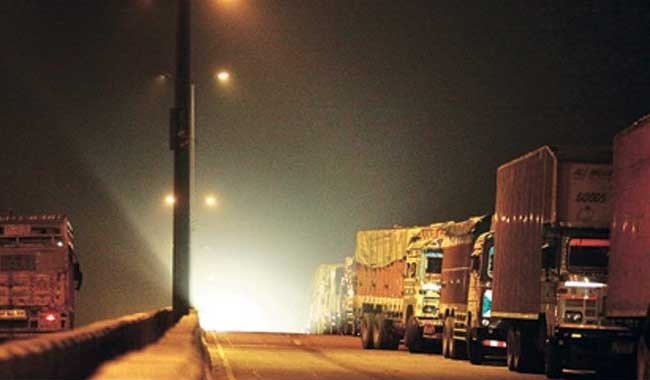 As part of measures to curb air pollution in the capital, Lt Governor Najeeb Jung on Tuesday ordered that trucks coming from other states will be allowed to enter Delhi only after midnight till January 31 next year. “The LG has ordered Transport Department to allow entry of trucks in Delhi only after midnight till January 31, 2017 to bring down air pollution level,” an official said. In today’s meeting, the Lt Governor was informed by Delhi Pollution Control Committee (DPPC) that it has recorded 1/3rd fall in PM 10 levels and 1/4th in PM 2.5 level in the last week. “In view of loss of income to daily wage labourers, the LG has lifted the ban imposed in construction and demolition activity in the city. However, ban will continue on firecrackers and diesel generators sets. “Jung has instructed to take action against violators of ban on firecrackers, particularly during marriage season,” the LG office said in a statement.